This piece is part of a series of sculptural dynamic forms that I have been developing for over a year now. The initial process involved making 3D CAD models and 2D CAD drawings, as well as Styrofoam and wood prototypes. I feel that I have now found a voice with my sand-textured vessel work - featured in Woodturning issue 223 - but, I've discovered there lies a deeper voice inside me that needs to bridge my artist side with my engineering/architectural side. I have been inspired by the grand architecture of Santiago Calatrava. With interpretation of his structures, I derived a series of wood sculptures that employ strong positive and negative spaces and shadow lines. The 'Torrent' pieces were turned on a lathe using two halves of a beautiful silver maple (Acer saccharinum) crotch section. The diameter of the tree was 3ft just below the crotch. I turned two large flat discs outboard on my Powermatic 3520B lathe. To create the image of falling water, the crown was removed and the feather areas were cut out. The forms were deconstructed on the bandsaw into segments. After careful sanding and dyeing blue, each group of segments was reconstructed with pins and glue. I prefer the premixed colour-fast alcohol dyes for colour consistency. Each form was treated with a linseed oil-based finish to create a soft water-like glow. Negative space and twist are created by rotating each segment before pinning. Sliding the two forms together simulates a boat wake form. The resultant sculpture becomes dynamic in three dimensions along with colour and figure to represent a torrent of sea water. Due to size and shape limitations on the lathe, the series has evolved completely on the bandsaw. 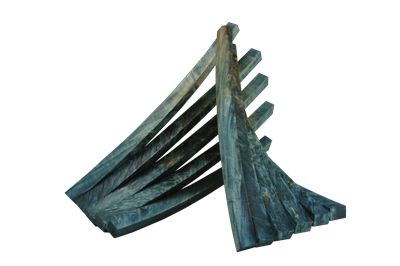 My latest sculptures have segments that are curved and tapered in two physical planes. The lathe has been an excellent prototyping tool and has led me to find a new voice in sculptures.